By Katherine Seymour, Memorials Officer. 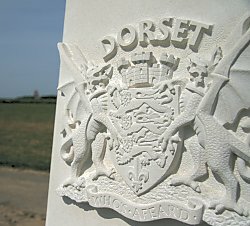 Launched in 2006, the 90th anniversary of the Battle of the Somme, the aim of the Dorset Great War Memorial Project has been to commemorate those men of Dorset and of the Dorset Regiment (a regiment which has now been amalgamated into The Rifles) who were killed or died in the First World War. The project has, from its inception, had the enthusiastic support of the Dorset & South Wilts Branch of the WFA, which helped to launch the fund-raising appeal with a donation of £500. Since May 2006, through regular updates from Dorset Great War Memorial Committee and Branch member, Roger Coleman, Dorset & South Wilts Branch members have followed the progress of the memorial closely. Through a bumper Christmas raffle, a bookstall and auction as well as individual donations and sponsorship of Roger's walk to churches with Dorset Regiment memorials, Branch members have continued to help to swell the project's funds. Members Helen Kerridge, David Seymour and Gary Toomer also undertook research into the Associated Newspapers War Memorial, which generated a donation of £2000 for the appeal. Branch members have watched the memorial develop from drawing to carved stone and from Dorset stonemason's workshop to final site in France close to Lonsdale Cemetery near Authuille Wood, from where the 1st Dorsets attacked the Leipzig Salient on 1st July 1916. The research which enabled this report to be compiled was conducted in 2007 - 08 by Helen Kerridge, David Seymour, and Gary Toomer, members of the Dorset and South Wiltshire Branch of the WFA. 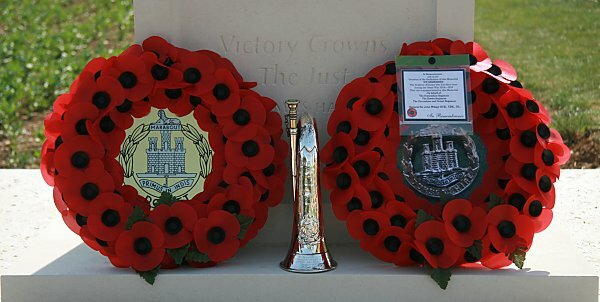 Lord Rothermere, proprietor of Associated Newspapers, suggested that if the Branch could find out something about the names on the Associated Newspapers' Roll of Honour he would make a generous donation to the Dorset Great War Memorial Project. The research was carried out and a grant of £2,000 was forthcoming in May 2008. The Associated Newspapers' Roll of Honour includes the names of men from all three of the firm's offices: Manchester, London, and Paris. There are 123 names on the Roll, of which forty-seven can be positively identified as referring to only one man. Of the remaining seventy-six the choice of possible identities ranges from two for J F Eastman, C T Howell, A E Marriot, and C A More to 1699 for A Smith. Of the forty-seven a number had family connections with the printing industry, at least two were from a military background, and two others had pre-war military experience. There was a slim Dorset connection for two families. In one case the casualty's mother and sister were born in Wimborne and in another the casualty's father was born at East Melbury. Most were born in the London area. Others came from Austria, Bishop's Castle, Derbyshire, France, Leeds, Liverpool, Manchester, Nottingham, Pendleton, Whitley, Winchester, and Wolverhampton. We were able to find photographs of three individuals: Tom Barnfield, William Arthur Bond, and David Schneider. The majority of the identifiable names were those of men who served with H. M. Forces whilst a few served with the French Army. The majority served in the Infantry (including the Black Watch, the Essex Regiment, the London Regiment, the Manchester Regiment, the Middlesex Regiment, the Royal Irish Rifles, and the Royal Sussex Regiment), mostly as private soldiers or non-commissioned officers. Others served in the Artillery, the ASC and the RAMC. The majority of these men were lost whilst serving on the Western Front. Further afield men are on memorials or are buried in Basra, Jerusalem, Lancashire Landing, Mikra, and Tehran. Most of the men were killed in action.